2018 IEAPS's Morning Lecture by H. E.
2018 IEAPS''s Morning Lecture by H. E.
안녕하십니까? 저는 사단법인 동아시아평화문제연구소 소장 이재형 입니다. 21세기에 아시아지역 국가들은 인구 규모, 경제력, 문화유산 면에서 국제사회의 주요관심 지역으로 부상하고 있습니다. 따라서 이 지역 국가들이 상호 신뢰를 바탕으로 주변 국가들의 역사, 정치, 경제, 문화 등 제반 현안에 대해 의견을 교환하는 것은 이 지역의 안정과 번영을 위해 매우 의미 있는 일이라고 할 수 있습니다. 이를 위해 본 연구소는 아시아지역 국가들의 대사를 초청해 조찬강연회를 계속하고 있습니다. 본 연구소는 2009년도부터 매년 2회 주한 아시아 지역 대사초청 조찬강연을 해 왔습니다. 금년 4월 20일에는 여덟 번째로 주한 미얀마 대사님을 모시고 귀한 말씀을 듣게 되었습니다. 연구소 회원은 물론 아시아의 현안에 대해 관심을 가진 분들의 적극적인 참여를 환영합니다. 조찬 강연회는 약 2시간에 걸쳐서 조찬, 발표 및 질의응답 순으로 진행됩니다. 감사합니다. Good morning H.E. Ambassador of Myanmar Mr. Thura Thet Oo Maung, distinguished guests, members of our institution, and delegates from foreign diplomatic corps. I am President of the Institute for East Asia Peace Studies(IEAPS). The region of East Asia appears one of the core spotlights in the international community in terms of the size of their population, economic achievement and cultural heritage. In this regard, I think it is very timely and important for regional experts to exchange views on regional history, politics, economics and culture. This institute has continued to organize the morning forum by inviting ambassadors from Asian countries since 2009. April 20 lecture will mark this year''s first forum event lectured by H. E. Mr. Thura Thet Oo Maung, Ambassador of Myanmar. So far, Ambassadors from the Philippines, India, Bangladesh, Laos, Vietnam, Nepal and Mongolia already finished their lectures. The forum will be held for approximately two hours including breakfast, presenting papers, and question and answer session. I sincerely hope you would be encouraged to take part in the forum. 안녕하세요. 저는 동아시아평화문제연구소 소장 이재형입니다. 오늘 강의를 해 주실 미얀마 대사님, 주한 외교사절, 그리고 내외 귀빈 여러분! 바쁘신 중에도 이 자리에 참석해 주셔서 감사합니다. Good morning Your Excellency Ambassador of Myanmar Mr. Thura Thet Oo Maung, delegates form the foreign diplomatic corps, and distinguished guests. I am Dr. Lee Jae-Hyung, President of IEAPS. Thank you very much for your participation and concerns for today''s morning forum. 본 연구소는 2009년부터 주한 아시아 국가 대사를 초빙하여 조찬강연회를 개최해 오고 있습니다. 이미 필리핀, 인도, 방글라데시, 라오스, 베트남, 네팔, 몽골 대사께서 본 연구소의 요청에 따라 조찬 강연을 실시한 바 있습니다. 오늘은 여덟 번째로 미얀마대사님을 모시고 귀한 말씀을 듣게 되었습니다. Our institute have conducted morning forums inviting Asian ambassadors stationed in Seoul since 2009. So far ambassadors from the Philippines, India, Bangladesh, Laos, Vietnam, Nepal, and Mongolia had already delivered their speech by the request of our institute. Today marks its 8th forum event by inviting H. E. Ambassador of Myanmar Mr. Thura Thet Oo Maung. 미얀마와 우리나라는 1975년 5월 16일 외교관계를 수립하고 현재 양국이 상주 대사관을 운영하고 있습니다. 미얀마는 1989년 6월 버마에서 현재의 명칭으로 바뀌었으며, 수도는 양곤(Yangon)이었으나 네피도(Nay Phi Daw)가 신행정수도로 건설되었습니다. Myanmar and Korea established diplomatic ties on 16 May 1975, and opened mutual embassy in both countries. The Republic of the Union of Myanmar was renamed after the former name of Burma in May 1989, and capital city was transferred from Yangon to Nay Phi Daw. 미얀마 상무부에 따르면, 작년 4-11월 사이 한국과 미얀마 양자 간 무역액은 5억 1,000만 달러로 수출액 1억 8,900만 달러, 수입액 3억 1,300만 달러를 기록했습니다. 미얀마는 주로 캐슈너트, 망고, 쌀, 콩 등의 농산물을 한국으로 수출하였고, 한국으로부터 화장품, 식품, 전자제품, 휴대기기 등을 수입하였습니다. According to Myanmar''s Ministry of Commerce the trade volume of both nations reached 5 hundred thousand dollars between April-November 2017. Myanmar exports cash-nut, mango, rice and bean, and Korea exports cosmetics, food, electronics, and cell phones. 양국 간 경제협력 중 건설인프라 부분이 가장 많이 활성화되고 있습니다. 미얀마에서는 ‘양곤 순환철도 개선사업’과 ‘양곤 만달레이 고속도로 개선 프로젝트’ 등 국가단위의 기간사업이 추진될 예정입니다. 이러한 추세에 비추어 국내 건설 중장비와 국내 건설 업체들의 현지 진출도 크게 늘어날 전망입니다. Economic cooperation between the two countries is very active in the field of infrastructure. Myanmar recently announced to initiate two major projects, including improvement of Yangon circular railroad and Yangon-Mandalre express way. Korea''s heavy construction equipment and construction companies are ready to participate in such projects. 작년 10월 한국철도공사(코레일)는 ‘철도 운영 및 시스템 노하우 컨설팅’사업을, 한국토지주택공사는 양곤에서 10㎞ 떨어진 지역에 72만 평의 산업단지 조성을 계약했고, 포스코-대우는 미얀마에 금속생산 설비를 갖추어 수출과 내수판매를 병행하고 있습니다. Korea railway company is consulting with Myanmar counterpart over the railway operating and system-knowhow. In addition, Korea Land and Housing Company made up Myanmar’s industrial complex of 0.72 million pyung and Posco-Daewoo constructed metal factory for exporting metal goods and selling them to Myanmar. 미얀마는 2017년 경제성장률이 7.5%에 달하며 풍부한 저임금 노동력과 천연자원, 전략적 입지 등 충분한 잠재력을 갖춘 시장입니다. Myanmar''s economic growth rate marked 7.5% in 2017, and the country has had various and great potential to develop including low-cost work force, abundant natural resources, and the nation’s strategic location. 한편 우리나라는 1988년부터 지난 해 12월까지 37억 8,000만 달러를 미얀마에 투자하였으며, 앞으로도 이러한 투자는 계속 될 것으로 기대합니다. Futhermore, Korea has invested 3.7 billion dollars to Myanmar from 1988 to 2017. Korea will continue to increase its aids to boast Myanmar''s well-being and economic development. 오늘 이 자리에서 미담 사례도 하나 소개할까 합니다. 금년 3월 한국에서 근무하던 미얀마 노동자 Mr. Win Htut Zaw(윈똣쪼)씨가 사고로 뇌사 상태로 있던 중 장기기증을 하여 한국인 4명에게새 생명을 주었다는 보도가 있었습니다. 주 미얀마 한인회에서는 그의 자녀가 있다면 장학금 지원을 계속 하려고 하였으나 자녀가 없어 그가 다닌 학교에 그의 이름을 딴 장학재단을 설립하여 장학금 지급을 할 것이라고 밝혔습니다. Today I want to introduce an impressive story. In March a Myanmar man named Mr. Win Htut Zaw who had been working in Korea was hospitalized under brain death. His family decided to donate his internal organs after his death, and this saved four Koreans. Hearing this moving story, Korean community in Myanmar established a scholarship foundation after his name for his old school. 이번 미얀마 대사님의 강의를 계기로 한국과 미얀마는 지금까지의 우호협력을 바탕으로 더욱 유대관계를 공고히 해 나가기를 기대합니다. 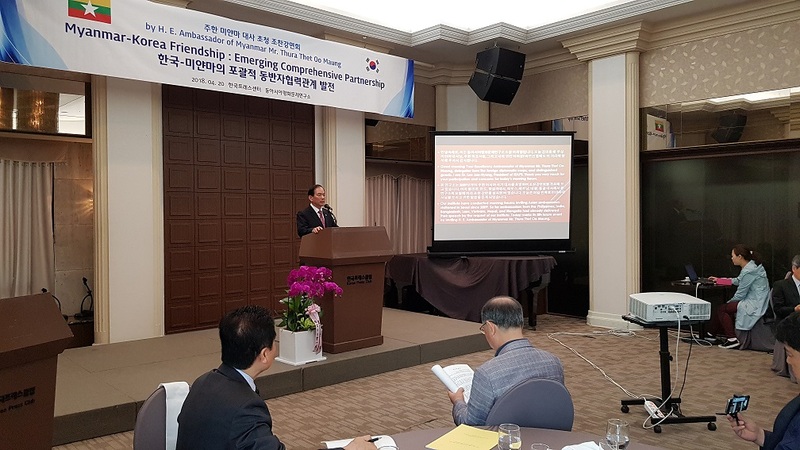 I am confident that through ambassador''s lecture in this morning would surely enhance mutual friendship and cooperation between Myanmar and Korean peoples. 오늘 조찬 모임을 위해 협찬을 해주신 몇 분을 소개합니다. 연구소 이사장 정병호 박사님과 저의 고등학교 동창생으로 인천광역시에서 솔의원 원장으로 재직 중인 배창권 박사, 그리고 로뎀코리아 대표 임태수(현 대한어머니회중앙연합회 회장)님이 함께 협찬해 주었습니다. 그 분들께 감사드립니다. I have to introduce some sponsors for this morning forum. They include Chairman of our institute Dr. B. H. Cheoung, my high school classmate Dr. C. K. Bae who is operating orthopedics in Incheon City, and Mrs Im Tae-Soo, Representative of Rodem Korea(also President of Korea''s Mothers'' Association). 오늘 이 자리에 함께 해 주신 모든 분들께 거듭 감사드립니다. 이어서 연구소 이사장 정병호 박사님께서 대사님 약력을 소개 하겠습니다. 감사합니다. Thank you very much for your participation this morning. Now Dr. Cheoung Pyoung-Ho, Chief Director of IEAPS will introduce ambassador''s personal history. Chief Director of IEAPS & CEO, Dong-in Electric Inc. Ltd.
H.E. Thura U Thet Oo Maung was born on 14 February 1958 in Tharrawaddy, Myanmar. He began his childhood life in Thonze, Myanmar from 1962 to 1977, where he passed his matriculation examination. He graduated from the Defence Service Academy, Pyin Oo Lwin, majoring in B.Sc (D.S.A). After graduation, he launched his career as a Second Lieutenant in 1981 and served in the Defence Services in various capacities, up to the rank of Brigadier General, from 1977 to 2007. During in his Military Services, he was honored by "Meritorious Services Medals" and conferred the title of "Bravery Award" for his hard working and distinguished career. In 2003, he received a Master of Art (M.A.) Degree in Defense as his further study. He was transferred to Ministry of Foreign Affair of the Republic of the Union of Myanmar on 2 April 2007 and appointed as Ambassador Extraordinary and Plenipotentiary of the Republic of the Union of Myanmar to Brunei Darussalam on 18 April 2008. Afterwards, he was transferred to the Arab Republic of Egypt as Ambassador from 29 October 2012 to 26 December 2015. 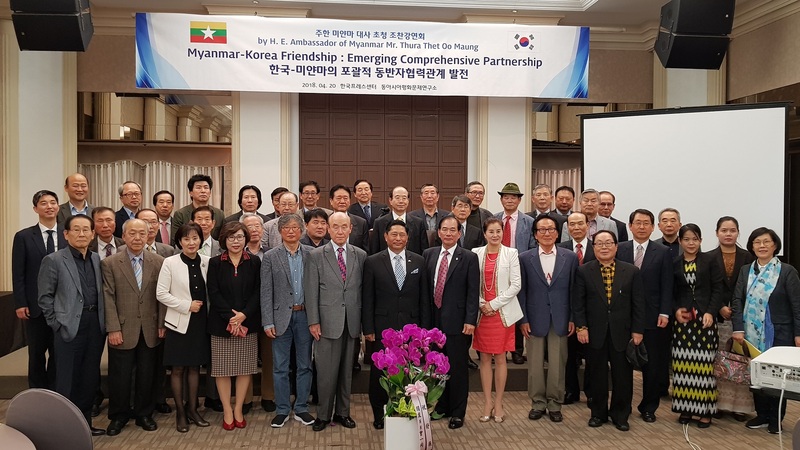 He currently serves as Ambassador Extraordinary and Plenipotentiary of the Republic of the Union of Myanmar to Republic of Korea since 27 December 2015. Today Ambassador will deliver his lecture in Myanmar language and his interpretor will translate it into Korean. Would you give him big hands? Thank you very much. 저는 연구소 이사장 정병호 박사입니다. 오늘 강의를 해 주실 미얀마 대사님을 소개하게 된 것을 매우 기쁘게 생각합니다. 그러면 투라텟 오 마웅 대사님의 약력을 간단하게 말씀드리겠습니다. 대사님은 1958년 2월 14일 미얀마 타라왔디에서 태어났습니다. 그는 1962년부터 1977년까지 미얀마 돈쯔에서 고등학교까지를 마쳤는데, 거기에서 대학입학자격교시에 합격하였습니다. 그는 이어 핀오 르윈에 있는 국방사관학교를 졸업하고, 이학사 학위를 수여 받았습니다. 그는 1981년 사관학교를 졸업 후 소위로 임관하였고, 2007년 육군준장으로 예편하기까지 국방 분야에서 근무해 왔습니다. 그는 군 재직 중 성실하고 탁원하게 근무한 공로를 인정받아, ‘용감한 군인’이라는 호칭의 미얀마 국방공로훈장을 수여 받았습니다. 한편 그는 군 재직 기간 중 공부를 계속하여 2003년에는 국방석사학위를 수여 받았습니다. 그는 2007년 4월 2일 군에서 예편하고, 바로 외교부에 보직되어 2008년 4월 18일에는 주 브루나이 미얀마 대사에 보직되었으며, 2012년 10월 29일부터 2015년 12월 26일까지는 주 이집트 미얀마 대사를 역임하였습니다. 그리고 2015년 12월 27일 이후 주 한국 미얀마 대사로 재직하고 있습니다. 이만 대사님 소개를 마치겠습니다. 오늘 미얀마 대사님의 강의는 미얀마어로 하시고, 대사관 직원이 우리말로 통역할 것입니다. 그럼 미얀마 대사님을 앞으로 모시겠습니다. 큰 박수로 환영해 주시기 바랍니다.